By Tsukihime, May 12, 2012 in Completed Scripts/Plugins/etc. This script is no longer supported. The default engine handles elements pretty plainly. When you have element rate feature, it adjusts how much more or less damage you take, regardless where you put the feature. This script changes it so that you can define element rates more accurately. For example, if your weapon has a fire element rate of 200%, that doesn't necessarily mean you should take 200% damage from fire. Distinguish between elemental damage and elemental resistance. Just copy into your project and set up your game as usual. Elemental resist is applied to actor, class, armor, enemy, and states. Basically everything else. Note that in the database, it is a little different that what you might expect. I have a question what will be the damage calculation if the defender has a - 100% resistance to ice while the attack has a 100% ice? I'm thinking 200% (just add weakness and strength together), but not sure if I want to do it that way. Note: from the database perspective, 100% is "full damage', 0% is "no damage", 200% is "double damage". Meaning, if you have +50% ice resist bonus, that means you should be reducing all ice damage by 50%. So then the bonus ice damage that you deal is reduced proportionally. So you only deal 100% ice damage, which is basically no bonus. In this case, enemy is weak against ice, so you deal 200% + 50% = 250% ice damage, or basically 1.5x bonus. I think it is more fair than doubling the ice damage to like, 400%. We could make it more interesting by randomizing which element is inflicted, so it's not always the one that results in the highest damage. My game is crashing every time and I get an error every time any actor does elemental magic damage. Script 'Elemental Modifiers' line 106: ArguementError occurred. The elemental effect percent values are displaying in my status menu however. Also, my damage is all off, and the yanfly "weakness" pop up text is no longer apearing. I'm not using any scripts that effect elemental damage other than yours. Before your script, I had a weapon that did "piercing" damage type. When I used it on enemies that recieved double piercing damaging, it did 12 damge and a "weakness" popped up. Now I when I use the same weapon on the same enemy, it does 18 damage, and no "weakness" pops up. There should be a numerical operator (I'm guessing) between "item.damage.element_id" and "element_resist_rate(item.damage.element_id)". I'm guessing it's supposed to be "-" (minus), since you'd want to substract the resist rate (and then add the attack rate). EDIT: With my testing, putting the minus sign in seems to work perfectly, and Yanfly's element popups also work normally. I included this script at the top of my script list, right after the feature managers and before Yanfly Battle Engine and Yanfly Element Popup. Honestly I don't actually know what the script is doing there. It's supposed to pick the element that does the most damage, but I have no idea why I wrote it that way. Btw this script was written in may so it is pretty rough. It would probably be easier to implement as a feature manager plugin. Please do. Or if you wouldn't mind fixing the one line that's broken, if you don't feel like writing it over. I clearly have no idea how these scripts work. It would work, but I think it was supposed to first determine which element did the most damage and set that as the element ID. If you just pick the item/skill's element, it may not be the optimal one. Okay, thanks. This is better than not working at all. I'll just wait until you re-do the script. Is it possible to somehow add http://forums.rpgmakerweb.com/index.php?/topic/538-runic-enchantment/ runes to be recognized by the elemental modifier? When I check the status on elemental resists, added resist runes do not show up. I'm thinking that it is not registering the runes because they are not technically equipped to the actor. Well as an alternative I decided to use your FP equip script to equip resist runes to the character so they are recognized by the modifier. This way I can keep the the rune slots on gear to adjust other modifiers like +EVA etc, but still being able to give the player options to add resists that will show up in the status. 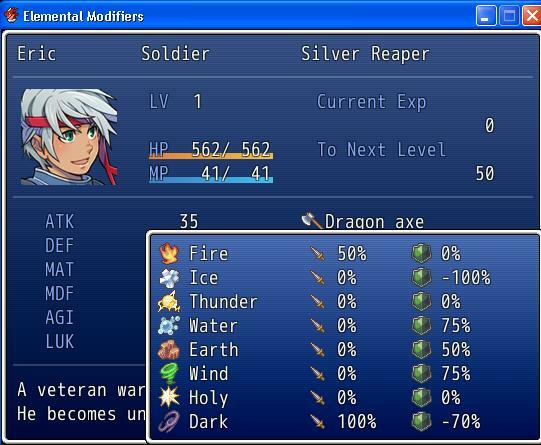 Do you think you could use his method for calculating elemental damage and incorporate it into this script? Thanks. I too have the same problem!!! I do not have plans to support this script you should look for alternatives that do a better job.